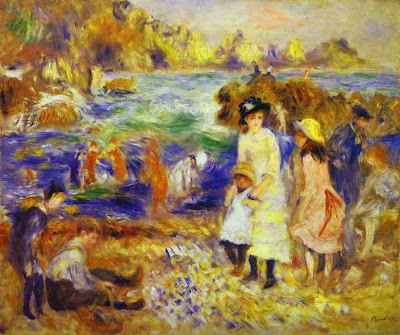 As part of our casual Summer Art Study, this week we enjoyed viewing a colorful and cheerful Impressionist painting by Pierre-Auguste Renoir. We pulled out the Impressionist Painting Scavenger Hunt notebook page to see how many things we could find in this particular painting. If you do this activity, leave us a comment and tell us how many elements you found from the scavenger hunt and we will see if we have the same number as you do. This painting really tells a fun summertime story. I created a notebook page for you to record the story you create to go along with this painting. You might try painting your own summertime beach artwork and then make a story to go along with it too. You can find all our summer art study selections and other free printable notebook pages on my Summer Art Show Pinterest Board. I invite you to join us for some casual summer time art fun. I recommend both of the books linked below as part of your Impressionist Study.